Soy protein is a protein that is derived from soybeans. 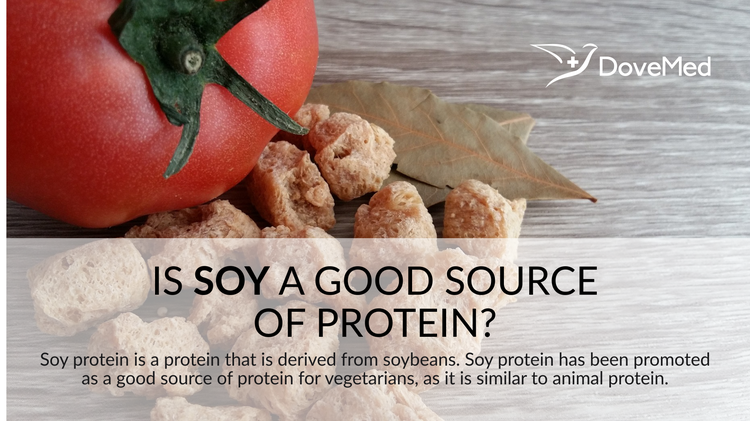 Soy protein has been promoted as a good source of protein for vegetarians, as it is similar to animal protein. Soy protein is a protein that is derived from soybeans. Soy protein has been promoted as a good source of protein for vegetarians, as it is similar to animal protein. It is obtained from dehulled and defatted soybean. It is used as a protein substitute for meat and products in vegetarian and vegan diets. It is consumed in the form of soy nuggets, soy milk, miso, tofu, and tempeh. In 1948, the Department of Biochemistry and Nutrition at the Agricultural and Mechanical College of Texas studied the essential amino acid composition of soybean meals prepared from twenty strains of soybeans. It was found that the amino acid composition was uniform in all the samples. Toasting lead to a negligible loss of lysine. A study published in the journal of Agricultural and Food Chemistry in 1959 analyzed the amino acid composition of water-soluble soybean protein and coagulated protein. The researchers found that the coagulated soy protein contained all the nutritionally essential amino acids, as compared to water-soluble protein. Soy protein is considered a healthy source of protein because it does not contain saturated fats along with essential amino acids, compared to animal sources of protein. Soybean contains all the essential amino acids that are required by the body. The American Heart Association Nutrition Committee stated in 2006 that soy products can be beneficial to cardiovascular disease and overall health as it has high polyunsaturated fat content, fiber, vitamins, minerals, and low saturated fat content. A review article published in the Journal of the American Dietetic Association in 1991 stated that processed soy protein isolates and soy protein concentrates can be used as a sole source of protein intake. This protein content is equivalent to the protein content found in animal sources. Soy protein can be beneficial for weight loss in obese individuals. Whole soy protein is associated with a number of health benefits such as reduction in cholesterol levels, leading to a reduction in cardiovascular disease. It is also linked to improvement in bone health and the reduction of hot flashes in post-menopausal women. A study published in the Journal of Nutrition in 2009 concluded that the consumption of soy protein can have a beneficial effect on serum lipids, which can reduce the risk of cardiovascular disease in individuals with type 2 diabetes. In October 1999, the U.S. Food and Drug Administration (FDA) approved the health claim that a diet low in saturated fat and cholesterol that includes 25 g of soy protein per day may reduce the risk of heart disease. Soy protein is a good source of protein along with many health benefits, but can sometimes cause an allergic reaction similar to that of common food allergens such as milk, eggs, wheat, fish, and nuts. A study published in the Journal of Nutrition in 2004 found that soy protein has a low allergic reactivity compared to other food allergens. The incidence of soy protein allergy is not as common as other food allergies. Soy-based foods are a healthier substitute for red meat and soy milk is an excellent alternative to cow’s milk in lactose intolerant individuals. These foods must be introduced in the diet very slowly. The Harvard School of Public Health recommends a consumption of two to four servings a week of soy-based foods, and consumption of excess soy protein does not offer added health benefits. Young, V. R. (1991). Soy protein in relation to human protein and amino acid nutrition. Journal of the American Dietetic Association, 91(7), 828-835.
de la Barca, A. C., Ruiz‐Salazar, R. A., & Jara‐Marini, M. E. (2000). Enzymatic hydrolysis and synthesis of soy protein to improve its amino acid composition and functional properties. Journal of Food Science, 65(2), 246-253. Bressani, R. (1975). Nutritional contribution of soy protein to food systems. Hoover, W. (1979). Use of soy proteins in baked foods. Journal of the American Oil Chemists’ Society, 56(3), 301-303. Montgomery, K. S. (2003). Soy protein. The Journal of perinatal education, 12(3), 42. Wolf, W. J. (1972). What is soy protein. Food Technol, 26(5), 44.